On August 31, 1964, a seance was held in which several people from the Roman Empire come through, wishing to speak in their own language. Our research today has determined facts about the spirits who came through that could not be known to Flint or to the sitters in the seance at the time. They were not even known, apparently, to Mickey, Flint's control on the other side. You can hear the recording of the speaker and a Roman woman singing by clicking on one of the icons below. The first speaker speaks briefly in English to introduce himself. He identifies himself as "Lucius" and says he had been a member of the Imperial Army, the army of the Roman Empire. He says that he was also known as (phonetically) "Lu-quil-us." He says he was "garrisoned" in "this country" for some time, and mentions a location Stewart Young, a listener to the tapes from South Africa, identified as "Verulamium," the third largest Roman settlement in England. At the time of the seance, the town was called St. Albans, so the sitters would have had no knowledge of the Roman Verulamium. 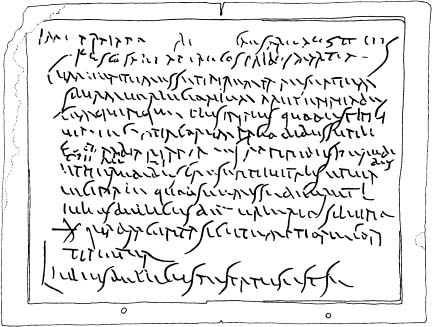 A Roman stilus writing tablet unearthed in England (see Figure 1 below) that came from a second-century Roman embankment on the Walbrook river contains this notation about Lucius Julius Bellicus as owner of the Verlucionium wood. Words that could not be made out are omitted. It breaks off after "that he" at the end. In the consulship of the Emperor Trajan Hadrian Caesar Augustus for the second time, and Gnaeus FuscusSalinator, on the day before the Ides of March [14 March 118]. Whereas, on arriving at the property in question, the wood Verlucionium, fifteen arepennia, more or less, which is in the canton of the Cantiaci in Dibussu . . . parish . . ., neighbored by the heirs . . . and heirs of Caesennius Vitalis and the vicinal road, Lucius Julius Bellicus said that he had bought it from Titus Valerius Silvinus for forty denarii, as is contained in the deed of purchase. Lucius Julius Bellicus attested that he . . .
(B. C. Burnham; L. J. F. Keppie; A. S. Esmonde Cleary; M. W. C. Hassall; R. S. O. Tomlin, "Roman Britain in 1993," Britannia, Vol. 25. (1994), p. 302). Those on the other side wishing to talk to the English-speaking sitters, in English, are helped by other people assembled with them on the other side, through the focus of their thoughts. In other seances, people in the afterlife talk about learning to speak English so they can speak directly rather than use the aid of others to translate their thoughts from their native languages. After Lucius speaks, Mickey, Leslie Flint's control, comes through to explain that a number of people from the Roman Empire are present. A woman then comes through singing a ditty in what seems to be Latin (language of the Romans). She begins by testing the voice box mechanism by singing "I like it, I like it, I like it to come speak to you, I like it to come to speak to you, I want to speak to you." She then sings the name "Mariana." A Roman site in Corsica, off the coast of Italy, that was founded in 100 BCE was named "Mariana." Today, it is widely known for its beautiful lullabies. Those who have listened to it and know something of the music in Italy say it sounds like a lullaby. Joe San Martin, a listener to the tapes who has looked into the Latin words, points out that they seem to include "mona Nina" or "mona Lina" (perhaps my Nina or Lina), "luciana," (shining, bright, light), "locuta," (listen), and other distinctly Latin sounding words. A string of words seems to be "luciana tu. Oh mona, mona Nina. Mona, mona Nina, la locuta nu." After the singing, you will hear Leslie Flint, Betty Green, and George Woods talking about the remarkable occurrence. Then, Mickey, Leslie Flint's control on the other side, comes through saying a number of people from an ancient time were assembled there, including some Romans. He leaves for a moment and comes back to say they are talking about Mithras. No one, including Mickey, recognizes what Mithras is except Betty Greene, who believes that he was a Persian god. We now know that Betty Greene was correct that Mithra (without the "s" on the end) was an ancient man-god from Persian mythology and culture, descended from a proto-Indo-Iranian deity, "Mitra." 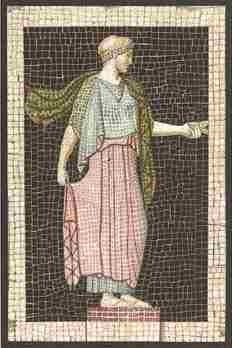 What she and the others in the seance didn't know is that the later Mithras (with an "s" on the end) man-god was the primary god of the Romans during the first century BCE through the second century CE, especially among the Roman soldiers. Those assembled were, in fact, ancient Romans. At the end of the seance, Dr. Marshal, a guide who regularly brought people to the seances, comes through to explain that he had brought this group of people from ancient Rome to speak to the group. The relevant portions of the seance recording are presented here. Click on one of the sound bars to listen. You may also click on the link that follows to listen to the full seance that includes other singing and some speaking in an ancient language, presumably Latin. Click on one of the icons below to listen to just Lucius followed by the woman singing. The next set of icons plays the entire seance. Listen to the entire seance by clicking on one of these icons.